On Saturday 6 October, two island giants clash for an unprecedented first. All roads lead to San Rafael. News that shook that island - that's the only way to describe it. Music On - synonymous with Friday nights at Amnesia - was going to stage the second leg of its three-day marathon closing at San Rafael's uber-nightclub Privilege. On Saturday 6 October at 18:00, a mere 11-hours after part one of its closing ends, the Italian mob takes over the biggest club in the world. How perfect is that. The very fact that Music On is capable of throwing three events at different venues in the space of 72-hours, underlines the party's unflagging popularity amongst the masses. Of course, this marks Marco Carola's first set at Privilege. Quite frankly, we can't wait. Music On has a reputation that spreads far beyond Ibiza's shores. It's global appeal can be attributed to one man. Marco Carola is the big dog who has forged the party in his image. Year after year, we can count on Don Carola to wow audiences with the music he plays. We know all too well that he isn't of the mindframe for over rinsing tracks, but here is a handful that have soundtracked Music On in 2018. George Smeddles's use of this classic vocal set pulses racing on the dance floor. Who wants to party with Carola? Roger that. Everybody, of course! Jack might have had a groove, but you know what? Carola's might just out-groove him. What makes this giant spectacle even more covetous is that Carola will close things out playing back-to-back-to-back with none other than The Martinez Brothers. We speak from experience when we say that this is going to be something worth seeing. 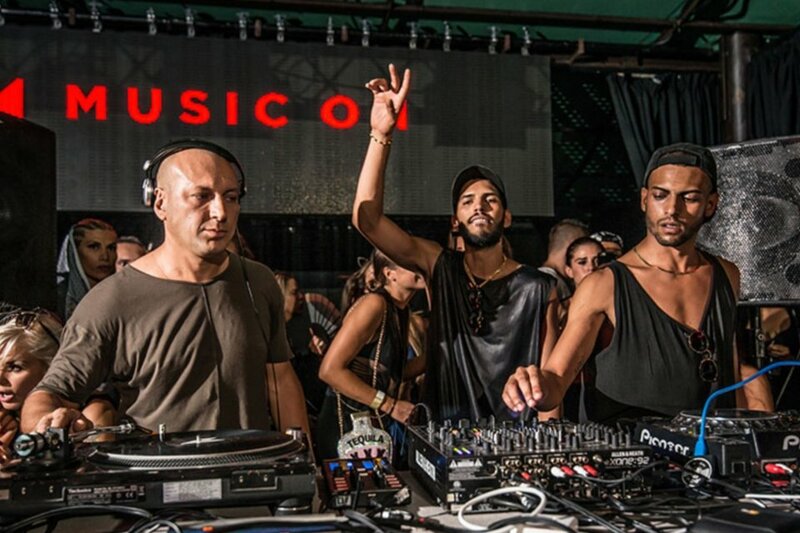 As recently as 21 September, Bronx brothers Chris and Stevie Jr. AKA The Martinez Brothers were Marco's esteemed guests on the Terrace at Amnesia. Always one of the most attended events of the calendar, this date provided a glimpse of what is set to go down on 6 October. Aside from their continued legacy being thrashed out at Circoloco, The Martinez Brothers are on an upward trajectory all round. Their list of 2018 accolades includes hosting their own party at Destino and a Friday label showcase alongside Tuskegee's third member Seth Troxler. Talking of their label, Cuttin' Headz seemingly gains momentum which each passing week. This summer alone, Loco Dice has contributed a release, as has Argy, while Argentine maestro Guti has an EP incoming. Speculation is now rife about who might be the as yet unannounced additions to the line-up. These technicalities remain to be seen, but what we can say without any hesitation is that The Martinez Brothers will be bringing their A-game. Duelling with Marco Carola behind the decks is likely to ignite fireworks in the booth. Let's not dismiss the importance of the undercard. Whilst they might not yet wield as much pull as our headliners, they are more than adept at storming the dance floor. In fact, we actively encourage you to check these guys out - often the unsung heroes. Firstly, Marco Faraone has not only found favour with Music On but also sees himself increasingly linked to the Drumcode camp. Away from these powerhouses, the Tuscany-native runs his own emerging label, UNCAGE. In 2018 we have heard his music all over the island - from RESISTANCE to IDOL. Here's a techno DJ whose star is on the ascent. Marco Faraone's future knows no bounds. Paco Osuna boasts a larger profile still. The Mindshake boss is considered one of Spain's most prodigious techno exports. He first found success of Richie Hawtin's M-Nus label before transitioning to a key figure in Hawtin's ENTER.Ibiza roster. After ENTER. 's presence on the island ended, Osuna made the switch to Music On. At Amnesia he again wasted little time in establishing himself as one of the party's most reliable floor shakers. Most recently, he appears to be focusing more on remixing the works of others than his own studio productions. Having had the pleasure of catching him support Adam Beyer at RESISTANCE earlier this summer, we can confirm that Osuna is still firing on all cylinders. During all the excitement over Music On, it almost passed our mind that this is Privilege's venue closing party as well. With this being the last chance to dance in the cavernous Main Room this summer, all signs point to this party being unmissable. For a firmer grasp on Marco Carola's sound palate and his trademark groove, head to our Spotify page and get listening to our dedicated Music On playlist. This is exclusively music we've heard whilst attending Music On - so it's an accurate reflection on how things sounded in 2018. It's all about the music. Everything you need to know - and those hot tickets - can be found below.